The Federal Budget and Appropriations Process represents the opportunity for NASFAA to advocate on behalf of student financial aid administrators for healthy funding for the federal student aid programs. This page includes a map of the federal budget and appropriations process and links to the most recent updates from NASFAA's Policy & Federal Relations staff at the bottom of the page. 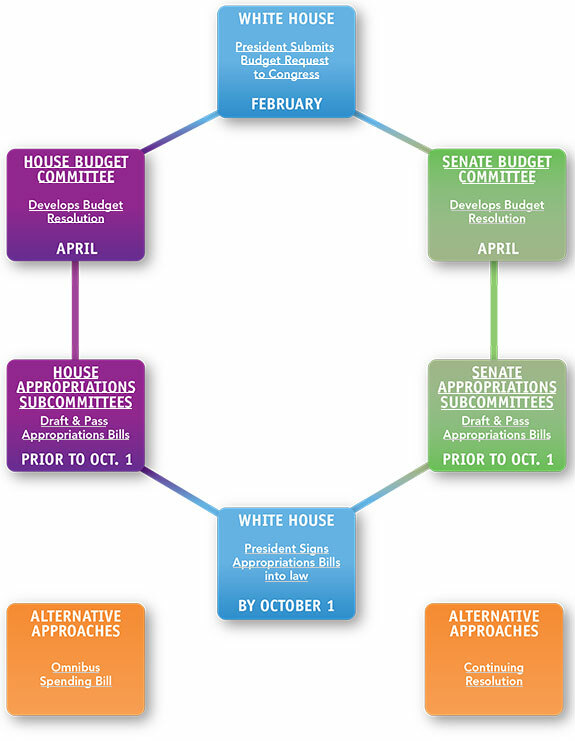 Hover your mouse over each step of the budget process diagrammed below in the graphic for a description and link to more information if available. January 3, 2018 - NASFAA has compiled the following Federal Budget Frequently Asked Questions Guide from member submissions. October 5, 2017 - The federal budget & appropriations process can be difficult to understand. To help clarify the process, NASFAA is developing a document with FAQs and answers related to the federal budget, and we want to hear from you. September 8, 2017 - The Senate Appropriations Committee wrapped up work on the fiscal year (FY) 2018 education budget on Thursday, passing the bill 29-2 and sending it to the full Senate for consideration. July 14, 2017 - A House appropriations subcommittee on Thursday afternoon swiftly voted on party lines to move a funding bill for the 2018 fiscal year to the full committee for further markup next week. March 17, 2017 - Early Thursday morning the Trump administration released its fiscal year (FY) 2018 budget request, which included significant cuts to certain federal student aid programs, and decreased the Pell Grant Program surplus. March 16, 2017 - Early Thursday morning the Trump administration released its fiscal year (FY) 2018 budget request, which included significant cuts to certain federal student aid programs, and decreased the Pell Grant Program surplus. January 28, 2016 - The Consolidated Appropriations Act for fiscal year 2016 (P.L. 114-113), signed into law by President Obama in December, set funding levels for all federal programs and also included some important policy changes. June 25, 2015 - The Senate Labor, Health and Human Services, Education, and Related Agencies (Labor-H) Appropriations Subcommittee approved their fiscal year (FY) 2016 spending bill on Tuesday. March 18, 2015 - House Republicans on Tuesday released their fiscal year (FY) 2016 budget resolution, which includes proposals to freeze maximum Pell Grant awards and address student loan debt.